If you remember the rubbish robot vacuums of yore, the Roomba 980 is nothing of the sort. It will do your floor cleaning for you. A great little luxury if you can afford it. You may think that being hitched to a tech journalist, with all those free gadgets, is a never-ending thrill for a spouse… you get given decent phones, get to use the latest and greatest TVs and sometimes get to drive in the latest and greatest cars. However, in certain quarters, people that I shall describe as, ‘The Wife’ see past these innovative technological marvels and see only boxes and potential mess and clutter. Surprise her with a new 65-inch OLED TV worth many thousands of dollars? Well, have you seen how big the box is for that? And yet this all changed when the latest iRobot Roomba 980 robot vaccum cleaner turned up. I was extremely sceptical of this device. The first generation of robot vacuums were so pitifully under-powered that I wasn’t alone in dismissing the whole tech genre forever. So a few eyebrows were raised when I unpacked it and The Wife absolutely lit up. “I’ve wanted one of these for ages!” She said. “It’s probably crap” I responded. I got glared at. So we unboxed the Roomba, set it on its charging stand and downloaded the app. The Wife actually managed to download it before me. The app is very intuitive and straightforward. But the first thing we needed to do was give the robot a name. The Wife called a family conference. This involved consulting with our four-year-old and 18-month-old girls. It was decided that the iRobot Roomba 980 would henceforth be known as Rosie The Robot. Welcome to the family. The rest of the app is straight forward. 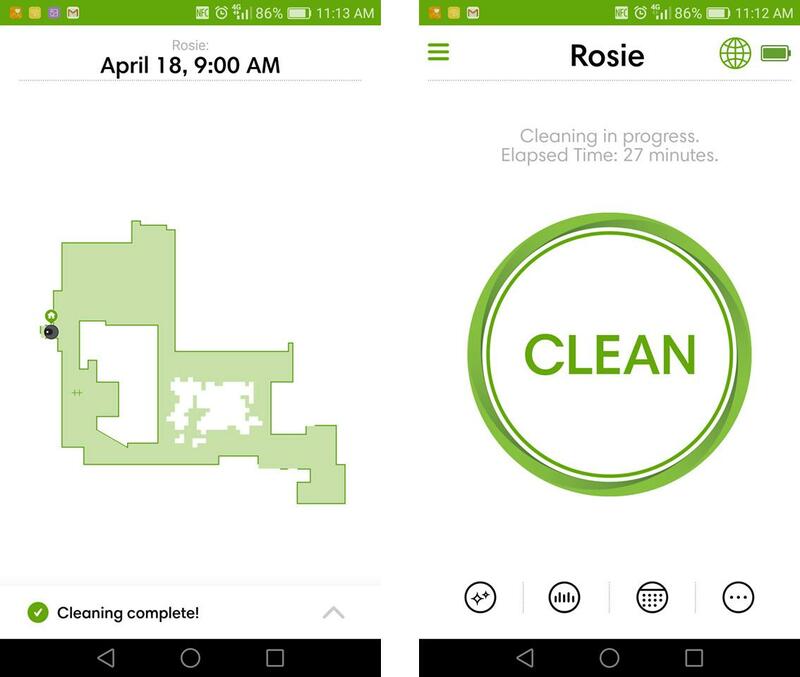 You can program what time each day Rosie will set off on her cleaning mission and she’ll report back with statistics, maps and any errors that occurred while on mission. The app sends a map of each of Rosie's cleaning tours. The speckled area shows that we didn't lift all the chairs onto the dining table. The big Clean button acts as one, big, internet connected remote. 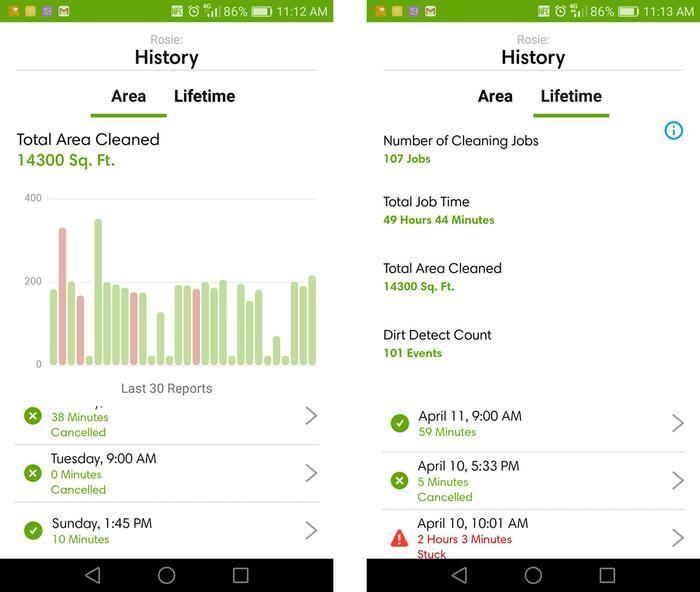 The app offers many analytics and mission reports. If Rosie gets stuck or becomes full then you're informed about it. Rosie, I mean the Roomba 980, connects to your WiFi network and operates according to the terms set by the app. However, there are three buttons on the top for more-manual control. One sets the vacuum off cleaning, one sends her (sorry it) home and the other sends her (oh sod this) on a spot-cleaning mission where you can place her on an area of spillage (for example a toddler’s shoe full of sand) and she’ll spiral round in a small area cleaning it up. When she starts, stops or accepts a new mission, she’ll cheerfully beep a happy tune. When she’s off on a major cleaning duty, she’ll use her main suction area beneath her body plus a small spinning brush to reach into corners, nooks and crannies.. It all looks rather fragile but it’s amazingly effective. Our floor is mostly hardwood with a shag pile rug. When she hits the rug, she adjusts her suspensions and raises her power levels accordingly - this power boost is unique to the Roomba 980 series. Getting over the relatively steep edge of the rug proves no problem. While on mission, Rosie will cover all of the floor that she is able to and do it in some kind of methodical manner where nothing is left out. It won't just be the rollers that track progress but sensors at the top note where book-cases, chairs and other 'land marks' are to help avoid repeating herself. The buffers that surround her on all sides mean that she’ll skirt round any awkward-shaped objects (like round-based coffee tables) but she’ll basically hit every crevice and send you a map of what she did. If you lift chairs and coffee tables off the ground, she’ll perform even better. It’s really quite impressive how she can clean most of what’s under a dining table, even among a forest of chair legs. Now we’re not a dirty household thanks to a house-proud The Wife, but a house containing two cats (one of which is quite fluffy) and three kids, one of which eats with its fists from a high chair, frequently gets messy. We didn’t realise how messy. That Rosie needs emptying almost every day because of all the cat hair and kids’ food she’s picked up never fails to astonish us. Where does she get it all from? Yet every time we return home to find shiny floors and we know Rosie has been around and done a good job. Sure, a Dyson may do a better job on a rug, but daily cleaning by Rosie makes a noticeable difference. There’s also the fact that The Wife, who simply refuses to ever empty the Dyson, actively enjoys emptying Rosie – probably because it represents vacuuming that she hasn’t done – which makes her feel nothing but warmth towards her. Every weekend she’s taken upstairs and does the bedrooms and even bathrooms (water isn’t good for her but she seems to handle sticky food and small puddles with aplomb when she accidentally goes through them). That she can travel under low beds that we can otherwise reach is a particular bonus. The Roomba 980 comes with two, separate, battery-operated buffers which can draw an invisible straight line that she cannot cross or illuminate a virtual circle that does likewise. These are to stop her ploughing into pet food or the laundry room etc. If there’s a rug, string or anything loose on the ground, expect your Rosie equivalent to get caught up in it. Once her rollers have got all tangled she’ll power down and send you a message saying as much. There are also the legendary tales of dog poop which are self-explanatory (and hilarious). They're well worth reading here, here and here. Beyond that, Rosie is generally self-sufficient, she’ll go home to her recharging station when she’s finished or full and she won’t fall down stairs. We still have to remind ourselves that Rosie exists sometimes. On occasion we’ll twig that somebody is vacuuming upstairs but The Wife and I are both downstairs and we don’t have a maid. It’s almost annoying that she can’t get upstairs on her own (yet) but we suspect a future relative will be able to do so. Our house didn’t feel dirty but after Rosie has done her rounds it feels noticeably cleaner when we all return home. I can’t really call her an it or an iRobot Roomba 980, as doing so just feels wrong. At $1,499 she’s something of an expensive luxury, but we can’t imagine not having her in the house now. She’s become part of the family. What a brilliant piece of technology. There are cheaper versions which have fewer features and less power but other rivals exist and we'll soon be testing them all. I just worry that testing competitors will feel like some kind of infidelity or hurt her feelings. I’ll have a word to her before I do.